Looking for a great gift for your bestie? 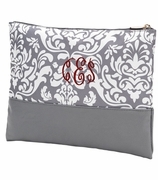 This cosmetic bag will make the perfect choice! 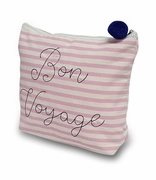 She is sure to use it on a daily basis reminding her of your close and long lasting friendship. The bag has a classic, simple pouch design with one compartment and a zipper closure along the top. 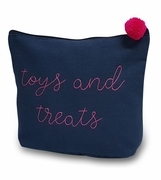 It comes in a lovely dark blue color and has the words ‘Best Friends’ written in fun, cursive hot pink lettering on the front panel. A fluffy hot pink pom-pom attaches to the zipper pull, finishing off the feminine look. The cosmetic bag is compact and can easily be slipped into a tote, travel bag, backpack or weekender duffel.